Every year I buy a planner, something super cute from Papersource or Anthropologie, and swear I’ll start using it. I have always loved the idea of a bullet journal. It’s creative, it’s organized, and it’s personal. But it’s also super intimidating. 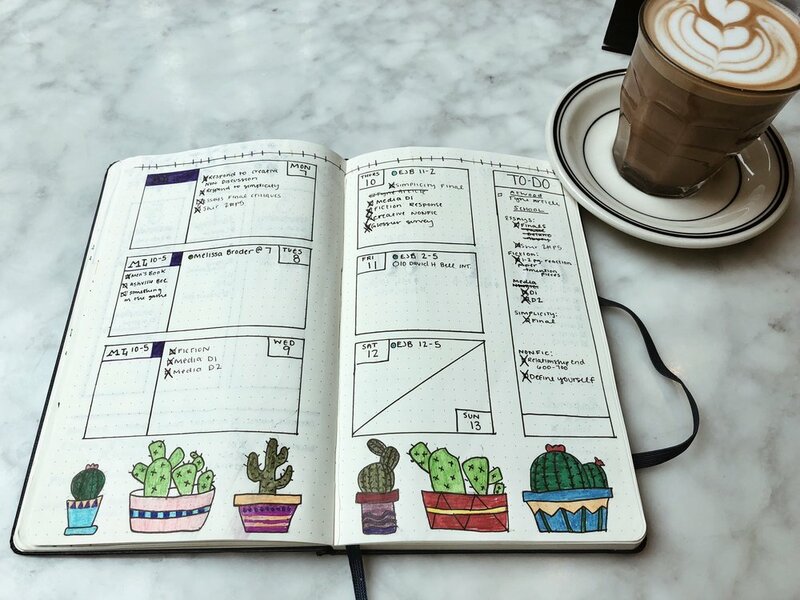 If I couldn’t keep up with a pre-bought planner, how would I commit to designing my own? 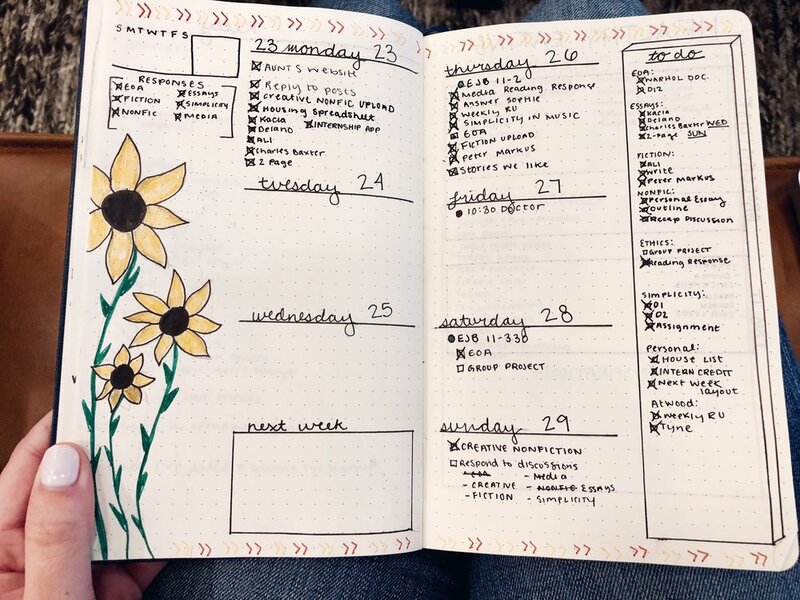 For those of you who have never heard of the bullet journal, imagine this. You pick up a blank notebook and create an entire agenda, calendar, and life guide in its pages...all on your own...all by hand. Then, of course, you’ll venture to Pinterest for some page inspiration, only to find the world is filled with much better artists than you with mega-creative takes on the classic calendar. I’ve wanted to start a bullet journal for about a year. I’ve seen photos on Pinterest and Instagram, and it seemed like a really wonderful creative outlet. It’s different from how my creativity normally manifests over a keyboard. There was something humbling about the idea of picking up a pen and creating something by hand. I’ve never been great at physical art without major direction, but under my own inspiration and design, I thought, maybe the idea would take. So, after inspiration from a friend who had been religiously bulleting for months, I got a dotted journal and I went to work. I’ve been using the journal for about two months, and it’s constantly filled with to-do lists, day-to-day schedules, blog ideas and anxiety trackers. I’m not a perfect artist, and my lines are rarely straight, but it’s more beneficial than I could have imagined. I have grown to love the bullet journal because of how personal it is. I don’t include anything I don’t need, and my spreads are constantly evolving to incorporate new additions (and to leave out those that proved to be a waste of space.) It’s so much better than a pre-bought planner. I feel a sense of pride when I finish a spread, and a responsibility to use it. Each section caters to my needs and interests. Toward the end of each week, I create next week’s spread. It usually takes an hour or so, and in that time, I am completely inspired, undistracted, and detached from technology. It’s a beautiful escape in which I get to create something, all while putting my attention on my upcoming week and responsibilities. Since using the journal, I’ve been incredibly on top of my weekly work. Everything that is put in my phone calendar is also put in my bullet journal. From doctors appointments to essays due and emails I need to send, every small thought has a place on the pages. It makes it impossible for me to forget a due date. My one rule in creating the journal is to roll with whatever happens. If a border line strays off the page, it stays. It’s a creative outlet for myself only, something others will rarely see. I don’t allow myself to stress over the perfection of the pages. It’s because of this the journal stays both a hobby and a responsibility. I’m still not open-minded enough to constantly create my own templates, so a lot of my inspiration comes from Pinterest. I will tweak a layout I find to incorporate my own important things, those being a daily schedule, weekly assignment chart, and an anxiety log. Even though it’s only been a few months, the bullet journal is something I see keeping in my life for a long time. Good pens. My go-to are thicker ink, particularly Graphik Line Maker (0.3). These have been my favorite pens since a hand-typography class I took a few semesters ago. A notebook with lots of space for creating. I chose one with dots instead of lines. That’s it! Chances are you can find a lot around of that around your house already. Just remember, the only limitation to your creation is your own criticism, so keep an open mind, and keep it fun.